Testing of online english dictionaries. This is a link to different online dictionaries. I tried a some of them and i found a favorite. There are a few of them i would beg you to stay away from because they are miserable. This dictionary translate to Spanish, Italian, French, Polski, dutch and a lot of other languages. The dictionary may read up you're world look up so you can hear how to spell it and it also give you sentences to see the word in a context. The dictionary tells you the meaning of the world to. The first thing I noticed was the clean and neat webpage. It is very easy to find out were to search and look for the meaning of the word. It translated very fast to. This is a picture of the dictionary I just recommended. I going to use this in my english class. I hope you will like it to. 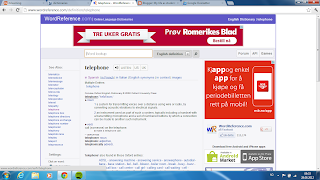 This is a monolingual dictionary and its also free. If you click the link you will enter the look up word telephone. You can see that the webpage tell you the meaning of the word. the dictionary may tell spell the word for you, that is a big plus! These dictionaries are very nice if you write or read an english text and want to use a little more difficult words. I tried the link and the free dictionary looks good. Could you explain what a monolingual dictionary is? The auto summarization tools will help you improving english and also show you various styles of english.